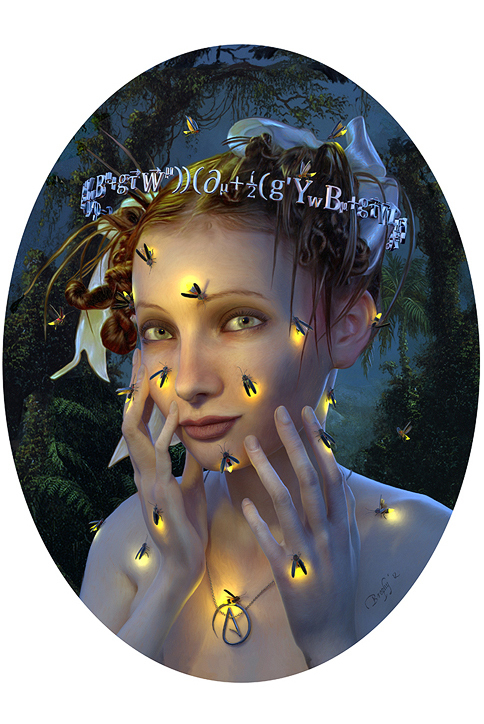 John Brophy is an American artist living in the Seattle area. His work explores spiritual themes through a technological lens; his oil paintings are rendered in a vividly three-dimensional style that makes them akin to digital renderings. The glowing, hologram-like characters interact with ancient goddess symbols and elements of pagan ritual. Brophy’s commentary on consumer culture becomes apparent when logos and dollar signs appear on the characters’ skin. John usually works out his compositions on the computer using Maya, ZBrush, and Photoshop and uses the result as a concept for the final painting. 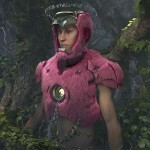 He loves the freedom that designing in 3D allows, even though it is very technical and demanding. However, he considers it vital for the quality of the object to execute the painting by hand in oil. 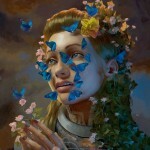 John Brophy has been showing his work at Roq La Rue Gallery for the past few years. He has also been featured in shows at Copro Gallery in Los Angeles and Dorothy Circus Gallery in Rome as well as in several publications.